Rowan County is located between the Piedmont Triad and the Charlotte metropolitan area. As of 2010, the population was 138,428, making it a fairly large county. The county seat is Salisbury. The county was established in 1753 and named for the state’s governor at the time, Matthew Rowan. In the 19th century, Rowan County was the center of economic activity in western North Carolina. Today, manufacturing drives the economy. Catawba College, a liberal arts college, is located in Salisbury. 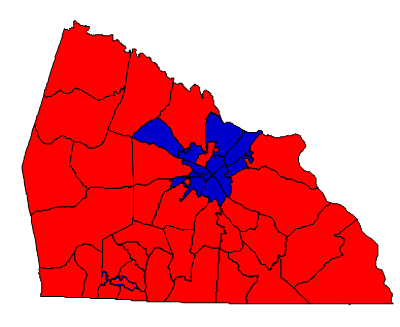 In 2012, Republican Mitt Romney carried Rowan County with 62% of the vote. Pat McCrory, an alumnus of Catawba College, won with 69%. In Congress, the county is divided between three congressional districts: the 5th, represented by Republican Virginia Foxx, the 12th, represented by Democrat Mel Watt, and the 6th, represented by Republican Howard Coble. Elizabeth Dole, U.S. Senator from North Carolina from 2003 to 2009, is a native of this county. Forecast: Rowan County’s politics have not changed drastically in the last twenty or so years. The last Democrat who carried it in a presidential contest was Jimmy Carter in 1976. Since then, Rowan County has consistently given federal Republicans anywhere from three-fifths to two-thirds of the vote. Any Republican looking to win statewide probably needs to win with at least 60%. Rowan County’s population makes it important for Republicans, Mitt Romney netted over 16,000 votes out of Rowan in 2012. In recent years, the county has evidenced a Democratic trend. This is due to greater registration and voting participation on the part of African Americans in Salisbury. The African American population is also growing at a faster rate than the white population. Hispanics number about 8% of the total population as of 2010. The growth rate during the 2000s was 6.21% for all segments of the population, which is below the national average and substantially below the national average. Rowan County’s total population will probably remain stagnant for the rest of this decade. Overall, don’t expect much change in this county going forward. Republicans are still dominant here, controlling the Board of Commissioners and the entire legislative delegation. Republican margins at the presidential level have only taken a slight hit over the past two election cycles, and it remains to be seen if this meager Democratic trend will continue with President Barack Obama off the ballot.